This Metal Gear Solid concept art by Ben Mauro is part of a much larger project by director Jordan Vogt-Roberts. 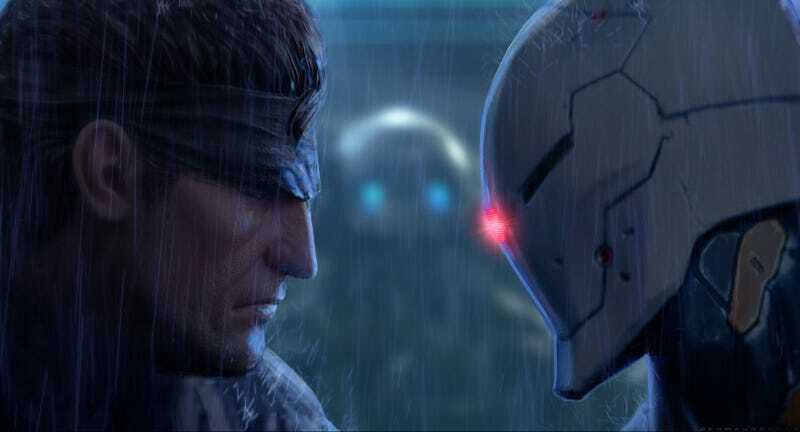 For the past month, director Jordan Vogt-Roberts has been on a mission: Spread a deluge of gorgeous Metal Gear Solid art on the internet to celebrate the franchise’s 31-year anniversary, and also show the world a small taste of the movie he wants to make. Vogt-Roberts, best known for directing Kong: Skull Island, has been attached to direct a Metal Gear Solid movie for several years. In that time, he has commissioned several “next-gen artists” to give a general feel of what his movie, if it ever happens, could be. So, for the past month, he’s been posting an image per day to celebrate the landmark game franchise created by Hideo Kojima. Below are just a few of our favorite pieces, with the director’s commentary, from the event. It’s worth noting, though, that if something is represented in this art, it doesn’t necessarily mean it’s going to be in the movie. Doesn’t make it any less beautiful though. Art by Nick Foreman.”The bond we formed via mechs reinforced that we should be loud w/our love of this franchise as we may find friends & collaborators in the process,” notes Vogt-Roberts. Art by Dennis Chan. “Metal Gear is full of what I call ‘military surrealism.’ It’s a delicate balance between horror-inspired-supernatural (nanomachines) & manga-stylized-magical-realism. I wanted to explore and capture these odder moments,” Vogt-Roberts said. Art by Nick Foreman. “Accurately bringing the MGS designs to life is one of my goals,” Vogt-Roberts said. Art by Jakub Rozalski. “I truly felt the world needed to see his heavy atmospheric style + Metal Gear,” Vogt-Roberts said of the artist. This week, the director sat down with Collider to discuss the status of the movie as well as the concept art. He and writer Derek Connelly recently handed in a script to Sony and they are currently working on studio revisions. What happens from there is anyone’s guess. But you have to think that if Sony executives see fans really get behind this work and Vogt-Roberts’ vision, maybe they’d be more open to giving us the Metal Gear Solid film we’ve wanted to see for so long. For much, much more on the movie, we recommend that in-depth Collider interview. And for even more of the art, open up the below Twitter thread and have your mind blown.